I have a love-hate relationship with shopping malls. I love the idea of one stop shopping but I hate how horribly big most of them are. As if this was not enough to leave me open-mouthed,those large independent chain of stores which have three or four floors of inside the mall tire me out completely. I almost never buy much while shopping in malls unless I am quite sure of what I want to buy before I go. Because knowing what you want makes it so much easier. But, if like me, you are most certainly clueless all the time, then what do you do? Just walk with the family aimlessly, stop at one or two stores when you find something pretty outside the window, then go inside and look at a few things and come out saying you didn’t like anything(The truth being that they are all way too expensive). But I love shopping for my son, so those quirky shops where you can buy some nice books, puzzles or a little toy is where I am happy at. Ok, I also like shops where they have fancy kitchen gadgets, or anything related to kitchenware. And I also love shops where they sell nice pastries. And recently I have also started to like shops that sell some nice skin care products too. So, you see, my problem is not with the shops itself, its the idea of putting it all inside one huge building with directions only in one corner. Oh well, but London isn’t full of malls. Thank goodness for that. I think my rant is over at this point and I am getting into serious stuff now. So, talking about skin care, I thought I will share my experience with a product I have been using recently hoping it will be useful for some of you looking for something new. As someone who only takes a minute or two to freshen up, reading up on how really to take care of your skin has left me in a state of shock. For the lazy person that I am, I have never thought beyond a face wash and a moisturiser. But somehow, turning 30 years old has bought with it a newfound devotion to skin care. Although I don’t really see any obvious wrinkling or dark spots, I have become the woman who wants to have better looking skin. Also, I am one of those women who has never been a fan of make-up and all that glam. I have no regrets for my skin isn’t too bad but I think we all could do with some extra help now and then. After all the reading up and endless videos I have watched on skin care, I have realised that the best way to get started is to simply wash your face every day before going to bed with a really good face wash. One that can cleanse all the gunk out of your skin… And then use store bought or homemade face masks/sleeping masks often and exfoliate twice a week. These simple steps that I have been following for a while has brought some remarkable changes to my skin. My skin is a lot more even and feels amazingly clean. To me, this is big and I feel so good that I am actually doing something for myself that works. And you may have heard about the various steps in skin care, like cleaning, toning, moisturising etc etc.. And I for sure know I cannot be one of those who can do all these day in and day out. So, I started to look for a product that can take me a step further and feel like I am doing something really good for the skin. Like, one multitasking product rather than buying a lot of serums/essences/oils. 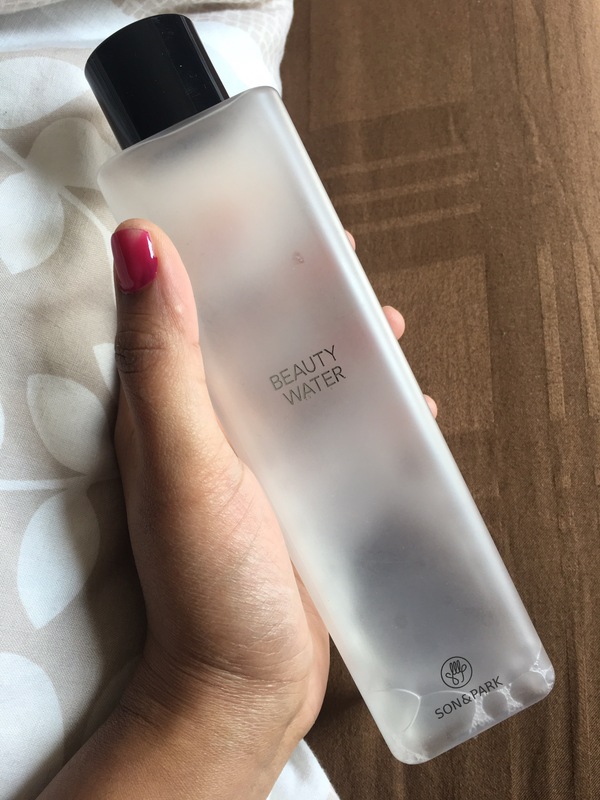 That is when I came across this Korean brand product called Son & Park beauty water. I have been using a dab of this liquid every single day for the past four months or so. I use it twice a day and sometimes thrice too. Because it only takes a few seconds to apply. Can you see I only have a little bit left??? I really love this stuff! This beauty water is just like water but beautifully scented. Not too strong and very gentle on the skin. It is a very smart multitasking liquid. It works as a toner when you want to. Some mornings, when I feel lazy to wash my face as soon as I wake up, I use this to refresh my skin. So, I would say it acts as a cleanser too. There have also been various afternoons when I feel like my face is dull and I want it to feel a bit more lively before stepping out for a quick walk or to the corner shop, then I quickly dab this stuff on my face and instantly feel better. DISCLAIMER: I am not an expert in skin care neither am I a model. Just a 31 year old mum who is trying to experiment with her life! And this post has been sponsored by my husband!